ARKDIS represented at Sixteenth International Conference on Grey Literature: Grey Literature Lobby - Engines and Requesters for Change at the Library of Congress in Washington D.C. The GL16 conference covered the topics 'Public Awareness of Grey Literature', 'Publishing and Licensing Grey Literature', Open Access to Research Data' and 'Managing Change in Grey Literature'. 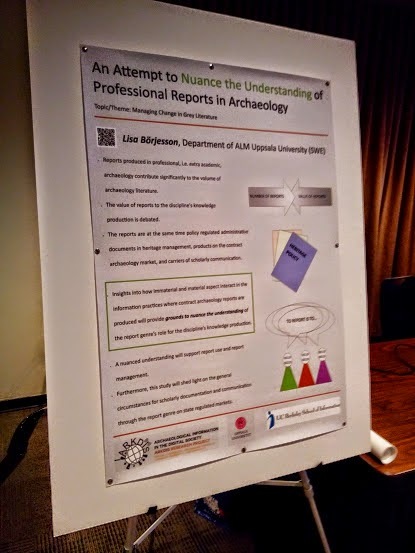 The ARKDIS doctoral student Lisa Börjesson contributed by presenting her dissertation research concerning the understanding of professional reports in archaeology. Perhaps the most relevant conference contribution supporting the ARKDIS research in this area came from the research program Environmental Information: Use and Influence at Dalhousie University (CAN). In a conference paper researchers Bertrum H. MacDonald, James D. Ross, Suzette S. Soomi, and Peter G. Wells state "Advocates of grey literature may believe this genre is undervalued or misunderstood, but lobbying for grey literature in the absence of understanding the contexts in which it is or can be used will likely fail unless information activity in those setting is understood." (GL16 program book, ISSN 1385-2308, p. 32). The ARKDIS research regarding the settings where archaeology grey literature take shape will arguably contribute to a better understanding of the possibilities and limitations of grey literature in Swedish archaeology. This workshop was held on 20-21 November at the Museum of World Culture in Gothenburg and at the Department of Historical Studies at the University of Gothenburg; including an open, public session on November 21 (see the previous entry, below). Thanks to all participants who made this a very interesting workshop; which addressed a number of overlapping and interconnected themes and questions. The international examples and the presentations that took up communication and mediation of culturla heritage aimed at different target groups (including in school environment) gave wider perspectives on issues surrounding the goals and means of digital mediation & communication of cultural heritage. Unexpected fields of commun interest seemed to emerge during the discussions of the workshop. Hopefully the workshop will generate "spin-off" in the form of new collaborations & partnerships - which also can reach outside the academic world. "[f]or the future, it is vital to make use of the manifold possibilities offered by digital material and tools. To utilize their potential positively we must develop more cross-disciplinary collaborations; avoid dichotomies when quantitative and qualitative methods and analyses are separated; become better at illustrating and communicating uncertainties; and last, but not least, formulate solid and important research questions." This is quite precisely to which ARKDIS project aims to contribute in the context of archaeology. So far, it has become apparent that the dichotomies are not only related to qualitative versus quantitative methods, but to many different aspects from the aims of the technology use to institutional and everyday work related priorities and marginalising tendencies.